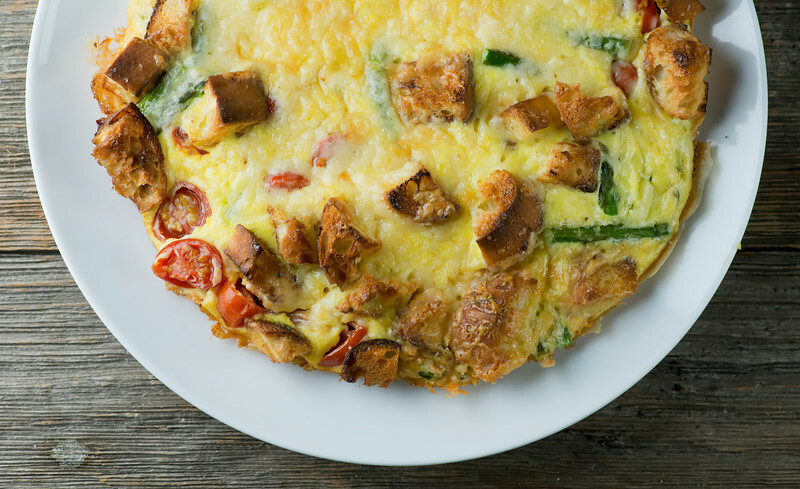 This quick and easy toasty cheddar vegetable oven frittata has everything from toast to cheese to veggies in it for the perfect all-in-one meal. It’s also a great clean out the fridge meal, as you can swap out the cheese and veggies for anything you like! Oh, this frittata! It is your eggs and your toast mixed up with some fresh veggies and just the right amount of cheese, all in one glorious conglomeration right on your plate. It’s perfect for Sunday brunch, perfect for a weekday supper, and perfect for using up the bits and pieces of veggies and cheese and whatever else you have in your fridge, because it can be varied to your heart’s content. My heart was very happy with these toasted chunks of ciabatta breed, sweet cherry tomatoes, chopped asparagus and Vermont cheddar all nestled in tender egg. This inspiration for this one came during our last trip to Vermont, where we had more than one delectable meal at The Pawlet Station in beautiful little Pawlet. It’s a small, friendly breakfast and lunch place that I love not only for the fabulous eats but also for many other things. I love that you can sit at the counter and watch your breakfast being cooked. 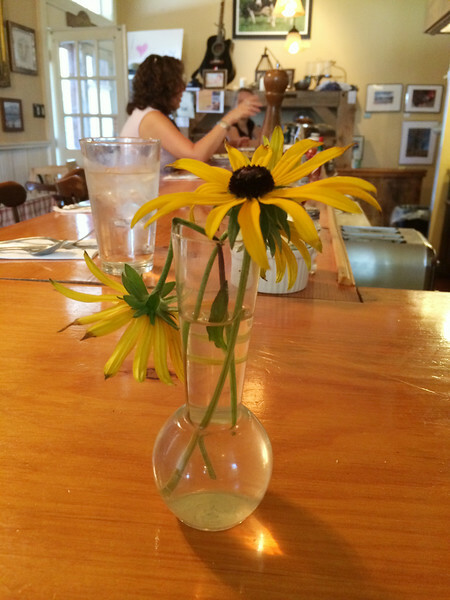 I love that the counter has black-eyed Susans picked from the front yard. I love that when you want your toast toasted Really Well Done they actually believe you and bring it to you that way. And I loved the frittata I had there one morning, which they started on the stovetop and finished under the broiler so that it was tender with just a little crispiness on top. So when we got home, I grabbed a frying pan and some eggs and got down to it. 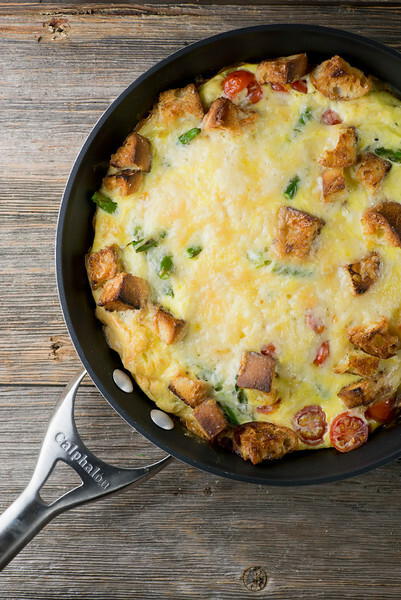 This quick and easy toasty cheddar vegetable oven frittata has everything from toast to cheese to veggies in it for the perfect all-in-one meal.Click to TweetFirst I used the pan to toast up the chunks of bread in a little olive oil until they were just the right amount of golden. Out they came, and in went another couple tablespoons of olive oil. Then I whisked up some eggs, stirred in the veggies and cheese and toast chunks and poured it in the pan. I let it cook just until the eggs were beginning to set – about a minute – and then popped the pan in the oven. 10 minutes later I had a pan full of this. I ran a thin spatula all around it and slid it onto a plate. And from there cut it into hearty slices and served it up to the Southern husband for supper, while happy memories of sitting at the counter at The Pawlet Station danced in our heads. You can customize this to your hearts content with different veggies and cheeses…I have a hunk of feta cheese in my fridge that is definitely headed in this direction. 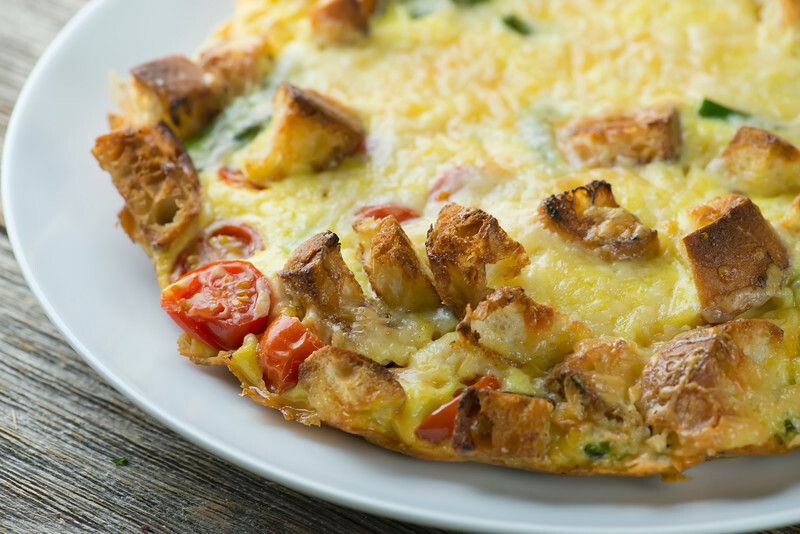 So happy breakfast, lunch and/or dinner…any time is frittata time! This quick and easy toasty cheddar vegetable oven frittata has everything from toast to cheese to veggies in it for the perfect all-in-one meal. Heat 2 tablespoons of olive oil in a ten inch oven-safe skillet over medium high heat. Add bread cubes and a sprinkle of salt and cook the cubes until they are golden, stirring often. Remove and set aside. Whisk the eggs until frothy. Stir in veggies, cheese and bread cubes. Heat remaining oil in skillet over medium high heat. Pour in the egg mixture and stir gently until the eggs begin to set, about a minute. Transfer the skillet to oven and bake for 10 minutes. Cool slightly and serve, either right from the skillet or transferred to a pretty plate (run a spatula under the edges to loosen. Feel free to swap out the cheddar and the veggies if you have other cheese and veggies you like better! I love that this has the toast AND the eggs all in one skillet! The best of all breakfast things. Right? Pondering what else I can add toast to. Made this for a light Sunday dinner and it was well-liked by all three teenagers. Another great dish – thank you! I know, THOSE THUNDERSTORMS! We let the dog sleep in the bed just for that stormy night, because she hates the thunder and was giving me the “Please Mom” eyes. And yes, Vermont!! Do it! !